I have been clearing out some of my "older things" in my office and came across a publication of AASL from the mid 90's. The occasional paper is called "Collaboration" and of course the document is still relevant. 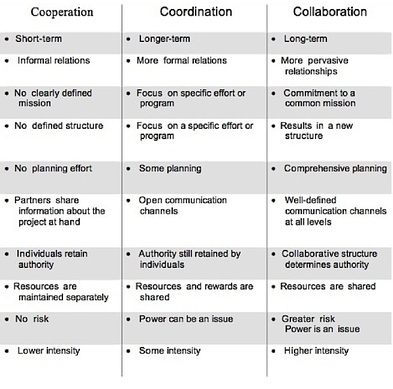 I found a lot of reaffirming ideas but the one I want to share is the comparison between the words Cooperation, Coordination, and Collaboration. These comparisons tell a real story. The Shawnee Library System and the Lincoln Trail Libraries System have created a shared Youth Services Blog called Youth Source. The purpose is to provide posts about Youth Services information for the librarians of the two systems. This opportunity to work together to create something better for the members of LTLS and ShLS is what we are striving for. If you have any suggestions of information to add to the blog please contact me.